June is here and it's time for another edition of "Gotta do THIS" focused on Calgary, Kananaskis and our surrounding mountain parks. Check out the events, activities, and destinations below, and add a few to your family's "Fun List" for the month of June. Fly High, Fly Safe, Fly Away! We recently had the opportunity to try our first fly with the Rocky Mountain Flying Trapeze company, set up at the Wild Wild West Event Centre across the road from Calaway Park. It was a pretty neat experience and while we definitely aren't ready for the circus quite yet, we tried something brand new for us and got to participate in an acrobatic sport that few people ever get to attempt. We had an introduction to some basic trapeze moves on the ground before climbing up to the platform, and my son had no problems with understanding what he was supposed to do once he was up in the air. You can see from the video below that he perfectly executed every move that he was taught on the ground. Kids have to be 7 years old in order to try the trapeze. Younger children can try the bungee trampoline as long as they are at least 5 years of age. The only other restriction is that adults be under 250 pounds in weight for the trapeze and under 180 pounds for the bungee trampoline (which really is designed for children anyway.) Other than that, it helps if you are fairly flexible (there's no way I was doing a knee drop and getting my legs up on that bar,) and you probably shouldn't have a fear of heights. This could be you by the end of the summer! - Celebrate your child's birthday here with a special party package! For full information please visit the Rocky Mountain Flying Trapeze website. Also, if planning to drop in for an Open Fly, make sure you wear socks, bring some water along, and wear sunglasses if you want to look up and watch family members on the trapeze! And make sure you scroll down to the bottom of this post to enter to win two flying trapeze classes. This would be an excellent way for a parent and child to go out together for a first fly. It would also make for a great Father's Day present! I like to include one road trip feature each month and wanted to tell you all about the cool things happening at Fernie Alpine Resort this summer. It's definitely not just a winter destination so grab your calendar and see if you can plan a trip here for sometime over the next few months. The first thing to tell you about is the Lost Boys Camping Experience! 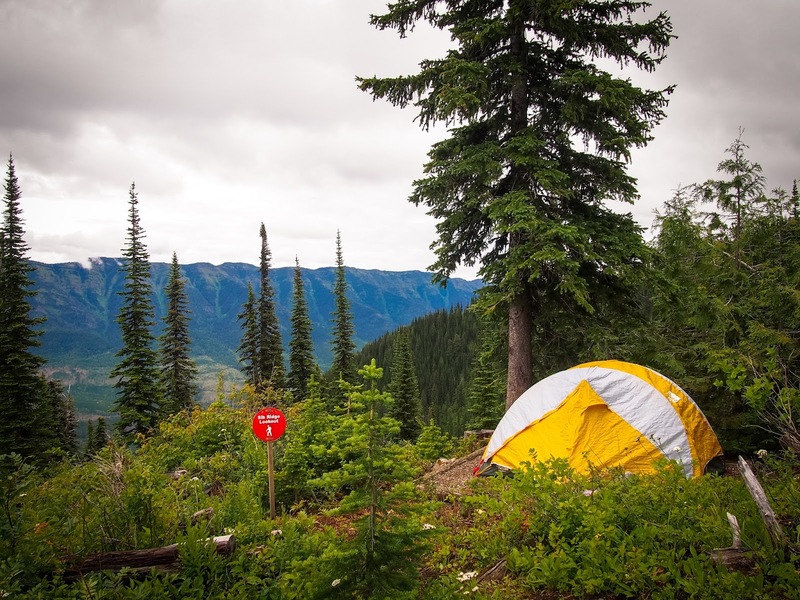 "An epic camping experience in British Columbia, the first of its kind in North America, awaits you! Sleep among the stars and wake up to spectacular alpine views near the top of the Timber Chair and Fernie’s famous mountaintop restaurant, the Lost Boys Café. Our camping package includes your lift ticket, campsite, guided hike, delicious raclette dinner, s’mores by the campfire, and breakfast. Top quality tents are also available to rent. 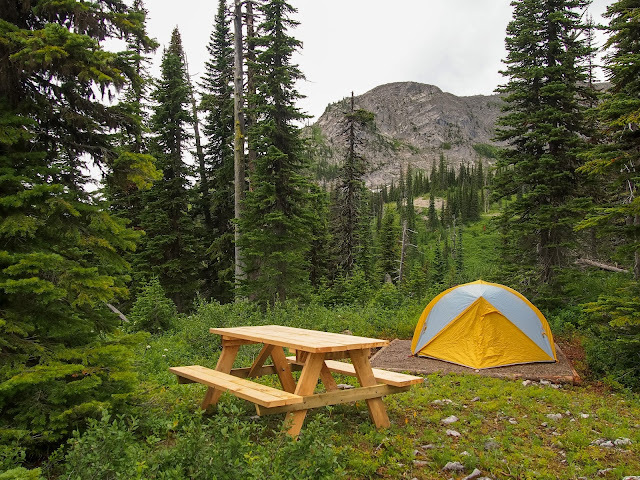 Camping is offered on Saturday nights throughout the summer. Additional dates may become available." Also, you can sign the kids up for a Howl at the Moon Camp out at the Lost Boys Cafe if you happen to be in Fernie on one of the weekends these camps run. We visited Fernie Alpine Resort two summers ago because we wanted to hike the Polar Peak Traverse from the top of the Timber Chair. It was an amazing hike and even had some fun scrambling on the ridge. We can't wait to go back and try more hikes at the resort. You can also read more here about the lift accessed hiking at Fernie Alpine Resort. 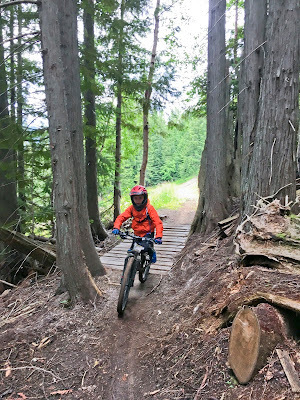 While the resort specializes in lift accessed downhill biking (think full face helmets and body armour,) cross country biking is becoming quite popular as well. Scott performance xc bikes can be rented at the resort for either a full day, half day, or 2 hr period. Guests can take them out on cross country trails which are easily accessed right from the resort or can ride down to the Mount Fernie Provincial Park trails, a short distance away. The resort is also offering bike lessons and programs designed specifically for cross country bikers. There's even a brand NEW 3-day camp designed for cross country riders interested in developing downhill bike skills. And for the kids, the resort offers two-day freeride camps over July and August. These camps are great for families spending time in Fernie over the summer. Sign the kids up for a camp and drop them off at the hill while you go check out the trails or the bike park yourself! Visit the FAR website for all information on lessons and camps. Almost makes you want to stay here with all the hiking and biking options, right? Add on a night of camping, sign the kids up for an outdoor adventure camp, and you've got the makings of a great vacation! And did I mention that there's a zipline too? And that there's also an aerial park? There's also a free aerial park for kids that are too young for the regular one. Information on all summer lodging specials at Fernie Alpine Resort can be found here. Who knew a ski resort could be so beautiful in the summer?! 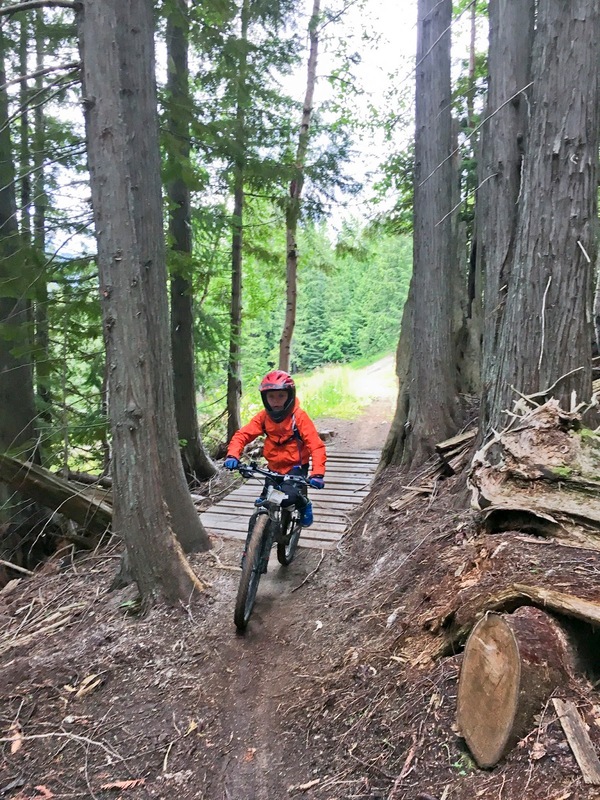 There's a great bike park for kids in downtown Fernie! The ice is gone from our easily accessible rivers and lakes, the days are long, and that spring sun feels really good on the skin. Below are my top picks for spring canoeing, kayaking, or even stand up paddle boarding with links to stories I've written. The Kananaskis River - Starting and ending at Seebe, you can paddle upstream as far as you want and then float back down after stopping on dozens of gravel bars to throw rocks in the river. This is a great choice for those not wanting to set up a shuttle. The Bow River - Starting approximately 6 km west of the Town of Banff, this short two hour paddle is pretty relaxed and you'll end up in downtown Banff with little effort. Largely a float, this trip is great for wildlife spotting and makes for a good half-day activity in Banff. Vermillion Lakes and 40 Mile Creek - We love paddling from the Banff Canoe Club dock up Echo Creek to 40 Mile Creek and into the first Vermillion Lake, and then gently paddling back down the creeks to our vehicle. Alternately, it's often easier to find parking along Vermillion Lakes Drive but it can be trickier to find the entrance to the creek. The paddle on the creeks is easy with little flow and is great for novice paddlers. The second peak I want to feature this month is Mount Lady Macdonald to the tea house platform. This is not the true summit but is the hiking trail to a large platform overlooking the Bow Valley. We did the hike last October and it's a fabulous hike for spring/fall when other mountains still have snow. You can read about our adventure here: First Summits - Mount Lady Macdonald Hike, Canmore. "Trails Fest is an opportunity for us to engage in a fun day of all things trails related. Learn about cool trail projects, explore diverse trail related clubs, groups and associations, and take part in facilitated trail activities, workshops and presentations." Trails Fest is hosted by Friends of Kananaskis Country and takes place on June 11th at the Canmore Nordic Centre this year. Connect with over 30 local outdoor clubs & organizations, and find out how you can get involved. Participate in guided activities and workshops including hiking, biking, trail running, and orienteering. Sign up for free workshops including sessions on bear necessities, trail running, orienteering and map reading, and how to be wild smart on the trail. For more information please visit the Friends of Kananaskis Country website. I like to keep things tidy with even numbers of 5 so I'm capping this at 5 awesome things to do or plan for this month. However, I do know that Father's Day is coming up on June 18th, and that the July long weekend is approaching. Below are a few stories you might want to check out as you make more plans to get outside this month as a family. You can't go wrong with a family bike day in Canmore! The contest closes on June 8th. A winner will be chosen that day and contacted by email. If I haven't heard from the winner by June 11th, I will choose a new winner. Yes, I tried the trapeze too and made the "jump"
Big Thanks to this Month's Sponsor, Rocky Mountain Flying Trapeze. I also want to thank Fernie Alpine Resort and Resorts of the Canadian Rockies for their continued support. Finally, thanks to Alberta Parks for choosing me to be an Alberta Parks Ambassador for another season. We've already camped in three different provincial parks since the end of April and have spent time biking, hiking, and exploring in Kananaskis over the past couple of months. I look forward to writing about some of our cool experiences in our provincial parks soon. Owen would LOVE the trapeze! Looks like a blast. I have never done a flying trapeze but love bungee jumping! My daughters and I love trying new adventures and would love to try this out! Great! I would love to try the Trapeze! Yes - please - I have 2 monkeys who feel the need the speed!! Looks like so much fun! We had no idea this existed!! I seriously would love to try this out! I took the Taste of Circus course with Firefly Theatre in Edmonton a few years ago - it was a lot of fun! I tried something similar in the Dominican and LOVE IT. Can't imagine doing it without the safety net though.... So fun! Looks amazing. I would love to do that lost boys camping trip! So, you have a 2.5 year old hiking + you are carrying a baby, correct? That's tough if the 2.5 year old has to do the whole thing on his own. If you are able to carry two kids (with your husband's help perhaps), many summits would open up. If you make it to Jasper, try Whistlers Summit from the top of the Sky Tram. It's a beautiful hike from the top of the tramway and it's a proper summit. Also in Jasper, the Old Fort Point Trail takes you to a viewpoint that would resemble a summit for your 5 year old - and it's blessedly short. Wow! This is THE list. I've been slowly putting mine together but you've been WAY faster than me! LOL And so creative too. Lots of good ideas here for sure. Thanks for sharing this great list with all of us Beth. You truly are a great resource! Wow, those are some fun-filled activities you've suggested. The lift-accessed camping at Fernie, that's awesome! I've not heard of that before. What a unique way to get into the backcountry, and possibly making it easier for families with young children to experience some higher terrain. I wonder if they'll be opening this up to more days/week if gets more popular. Your post has definitely put Fernie onto my 'must go here' list! Thanks for sharing. Wow!! Thanks for sharing this post.